Even with preventive measures in place, such as securing perimeters, lining equipment up, chaining equipment and video cameras, heavy construction equipment theft continues to happen. The lure of reselling an entire machine or the parts is strong. Coupled with that illegal demand, machines are being stolen to be used for actual jobs. Bids are so competitive and overcoming machine security so simple that stealing rather than renting or buying becomes the desperate option. It’s lucrative for the thieves. And, California was the top state for theft and recovery last year. Regardless of location, businesses can help further protect their equipment from loss due to theft using a combination of asset telematics and LoJack® Stolen Asset Recovery. A mixed fleet leveraging a universal telematics system, such as AssetOutlook™, provides secure alerts of possible unauthorized use and theft. There are alerts triggered by ignition on and movement during off-work hours. Fleet owners can literally watch their fleet in the palm of their hands with the web version of the application giving them visibility where it never existed in the industry. Weekend “side jobs” no longer go unseen. With established geozones, you can be notified when an asset enters or leaves the area. The mapping function lets you locate an individual machine or a group across a specified area. With hundreds of millions of dollars of recovered assets to date, as cited in LoJack’s 2016 Construction Equipment Theft Recovery Report, the LoJack® System can be a smart added layer of security for any contractor or equipment rental firm. The latest LoJack® Construction Equipment Theft Recovery Report was released in August. You may access the PDF here and the infographic here. It runs like a Deere? Well, in this case, a John Deere 310 backhoe was stolen from a construction site in Benicia, California. The owner notified the Benicia Police Department and the LoJack transponder was activated after the information was entered into the crime computers. Within 30 minutes, the San Diego Police Department – 500 miles south – picked up the signal. The backhoe was located in a commercial storage yard near the Otay area at the U.S. and Mexico border. The equipment was returned undamaged to the owner which was valued at over $30,000 (according to MachineTrader.com). 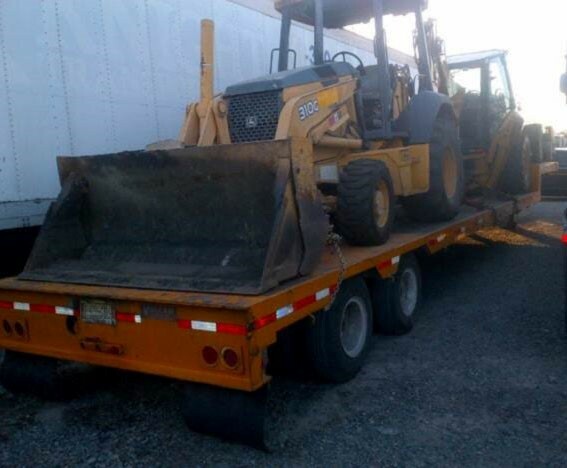 Below is a picture of the stolen backhoe. Towable assets are at risk too. This category of construction equipment ranked second in the 2016 LoJack theft study and first in the 2015 study for most stolen. 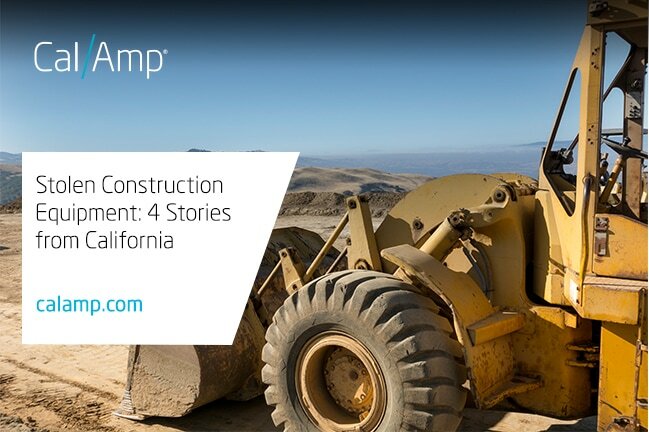 So it’s no surprise that a 2014 Multiquip generator was taken from a jobsite near Bakersfield, California. The Kern County Sheriff’s Department was notified by the owner and the LoJack signal activated. 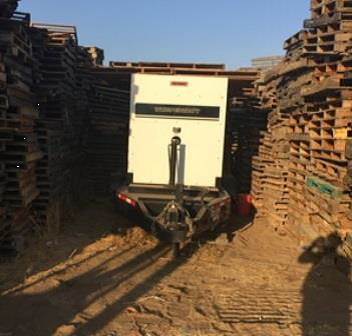 Only a few minutes after receiving the signal, investigators tracked the generator to the southeast part of Bakersfield on a large commercial property surrounded by stacks of wood pallets. A search warrant was obtained since the view was obscured. The department also recovered additional stolen equipment and one vehicle at the site. The investigation found that the site was being used as a chop shop. Multiquip was the third most taken manufacturer in the 2015 theft study. Below is a picture of the generator amongst the pallets. In both the 2016 and 2015 LoJack theft studies, Bobcat equipment was the top manufacturer stolen and recovered. The owners of a 2012 Bobcat Skid Steer notified the Orange Police Department of the theft and a short while later the Garden Grove Police Department, under 10 miles away, picked up the LoJack signal. The officers found the Bobcat in the back of a dump truck parked on a residential street. They recovered the equipment with the help of the suspect’s family member. From the 2016 theft study, the class of skid steer loaders had an estimated replacement cost of almost $37,000. These four theft and recovery stories demonstrate the fact that thieves tend to work regionally. The 2016 LoJack® Construction Equipment Theft Recovery Report showed that 97% of recoveries occur within the same state as the theft. In all but one of these incidences, the equipment was found only a few miles from where they were taken. Hopefully, your construction equipment remains safe. Remember to use the common sense practices of process and restraint. Plus, add a layer of technology to protect your equipment from theft. If you would like more information on AssetOutlook, please visit our page here here. And for more details on the LoJack® Stolen Asset Recovery (LoJack® System), please visit here.